A promotional poster outside the Pepper Lunch diner caught my attention while I was walking at the rooftop garden area of Ayala Center Cebu one day. It was mid-morning. And I was looking for some new place to eat. So I decided I'll try this thing. This wasn't my first time to really eat at Pepper Lunch as I visited their old spot near the Active Zone a couple of times before. Wait, that was Sizzlin' Pepper Plate and not Pepper Lunch. But the latter one's so eerily familiar with the former. 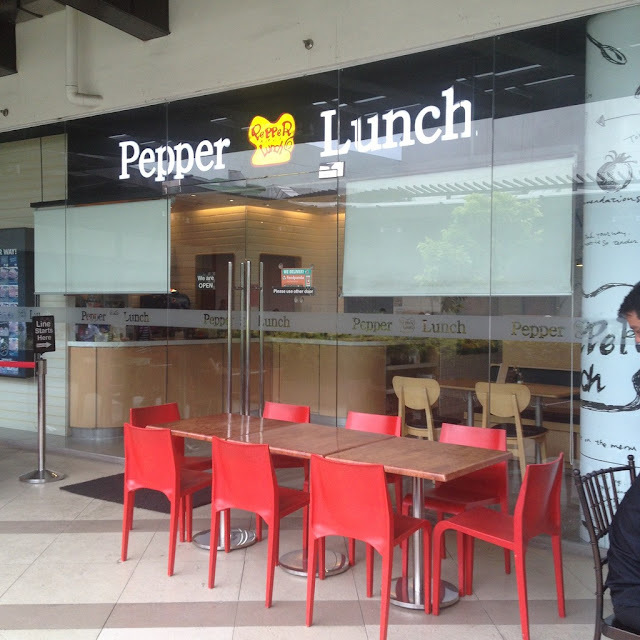 I do not quite remember that Pepper Lunch was a Japanese restaurant. How pleasantly surprised I was when I heard the familiar "Irashaimase" greeting customary in most Japanese restaurants. If you know me, you know I am a sucker for Japanese food. No hot towels though. This one is more of a fast food type joint. Instead of waiters taking your orders, you come up to the counter and place your orders. There weren't too many people in the diner. Except for a young couple and an old guy quietly eating in their respective tables and an old woman who ordered some to go food. Inquiries for my team building service have been starting to peak this mid-February and so I am pre-occupied with a lot of meetings here and there. 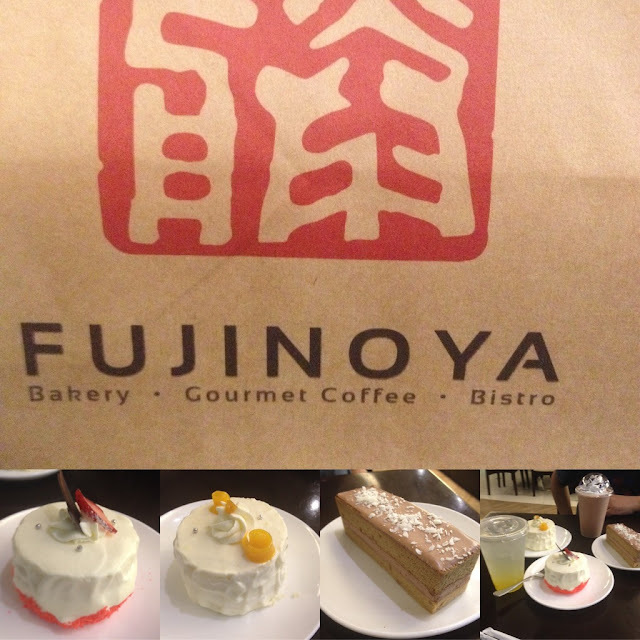 I had one business meeting over dinner at the Zubuchon Escario Central Mall branch on a Tuesday night. One of the things I like about business meetings is being able to explore what restaurants have to offer. 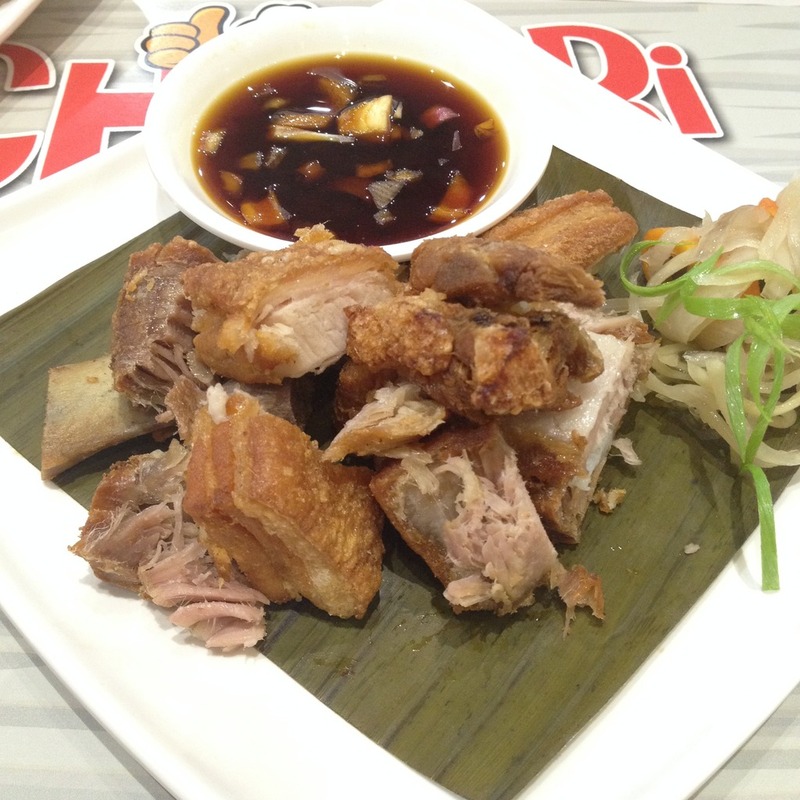 We all know that Cebu's lechon is craved for by many around the Philippines. Zubuchon's business is also built around lechon so people will at some point compare Zubuchon's own lechon with that of the traditional Cebuano lechon. I had the same curiosity. So I ordered Zubuchon's boneless lechon. The waitress who took my order wasn't probably paying proper attention and she brought us Zubuchon. While I accepted the order anyway and didn't make a fuzz out of it, this can be disappointing for some people. Choobi Choobi Restaurant has a Korean-sounding name. They actually serve more Filipino dishes on its menu. It's house specialties are grilled meat and seafood dishes. According to their website Choobi choobi is derived from a Fookien word that means "to enjoy". 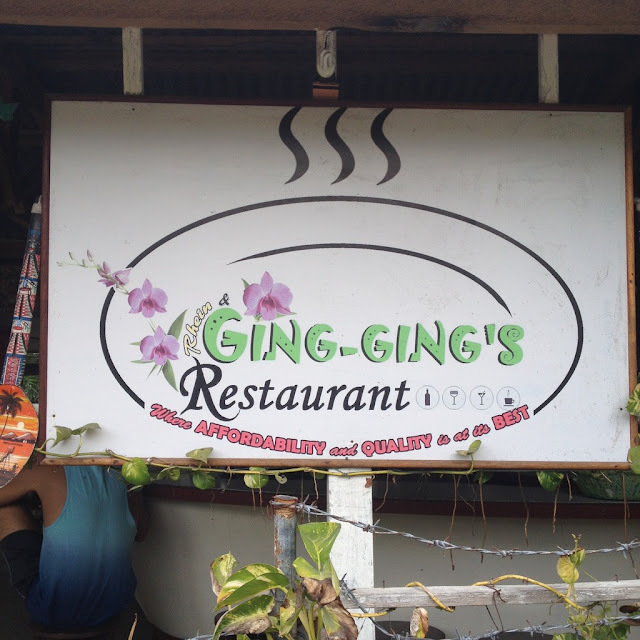 It is from that foreign word that the restaurant got it's tagline: "lingaw-lingaw kaon". 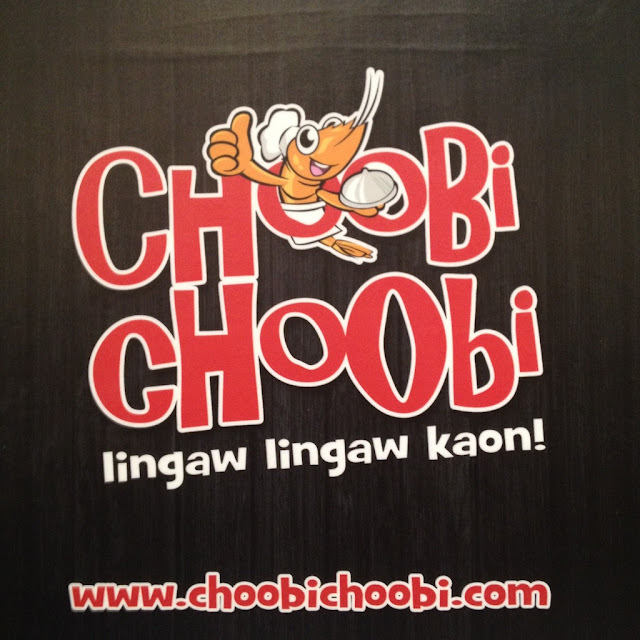 One Thursday night on February 2016, we dropped by the Choobi Choobi branch at the SM Seaside City to have dinner. For appetizers, we ordered shrimp tempura and baked scallops. The menu indicated Patrick Star's Baked Scallops as one of the house specialties. In my opinion, I think it tasted more of burnt cheese and butter. One order cost PhP 165 with about ten pieces. 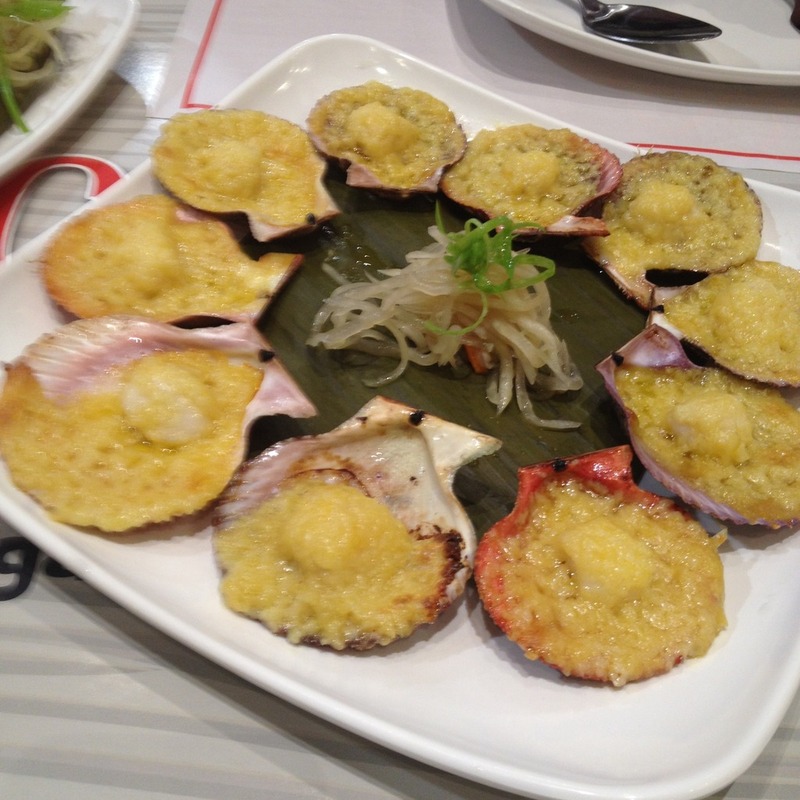 My top places for best scallops in Cebu are still the ones from House of Lechon and STK ta Bay! 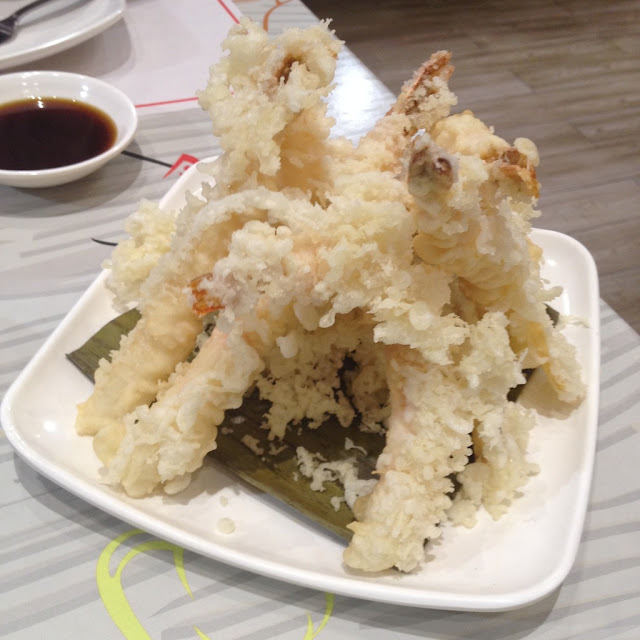 Their tempura though can rival some of the best tempura I have come across in Cebu. And it's a good bargain at PhP 175 for about six pieces. 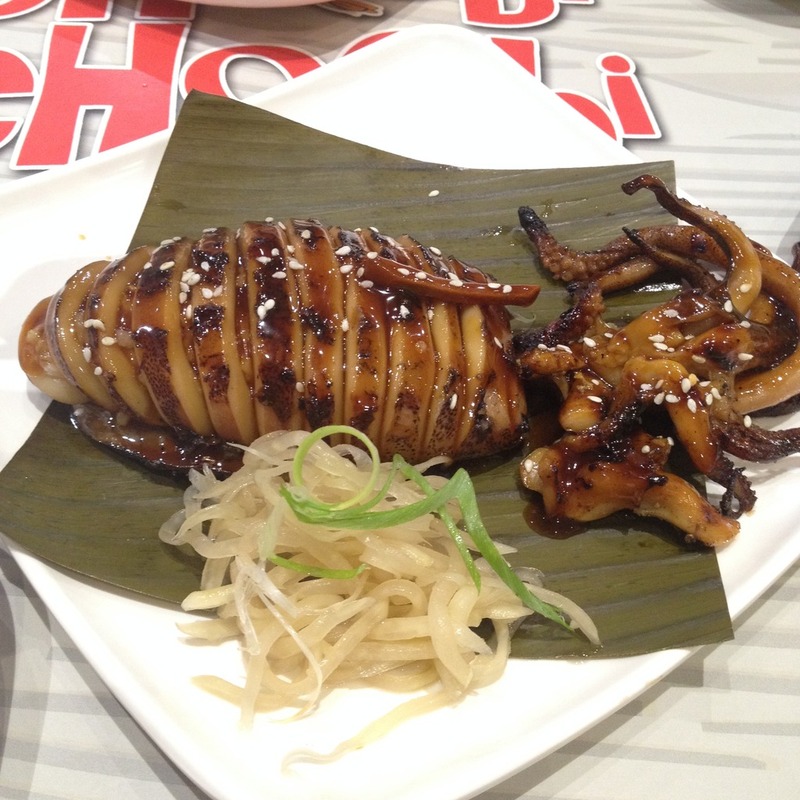 For the main course, we ordered medium Stuffed Grilled Squid priced at PhP 195. I got curious since the menu read "Try and see what's inside". So what was inside? Steamed rice. Blah! So much with the disappointment of seeing just steamed rice as stuffing, the grilled squid was actually pretty good. Most probably they used some teriyaki sauce or sweet Worcestershire sauce on the basting. We usually abhor sesame seeds on our food. But we didn't even notice until we reviewed the photos we took that this one had sesame seeds on it. 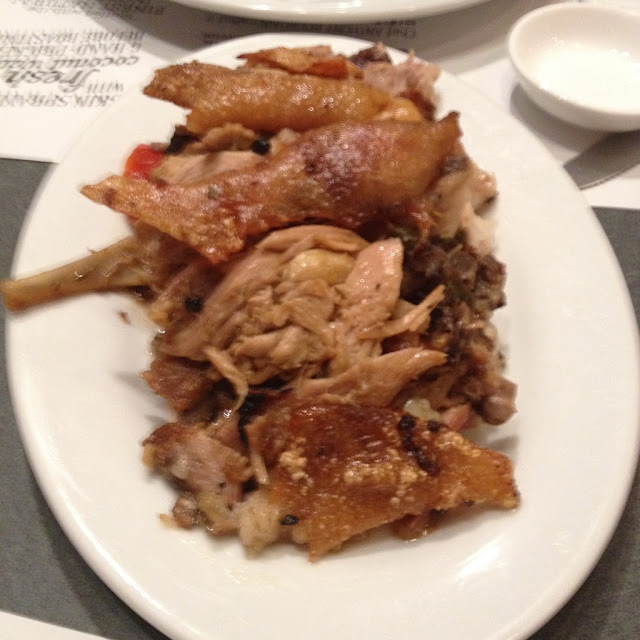 The other food item we ordered was lechon kawali. This was a disappointment. The crisp on the rind was right but the meat was hard and not juicy at all. 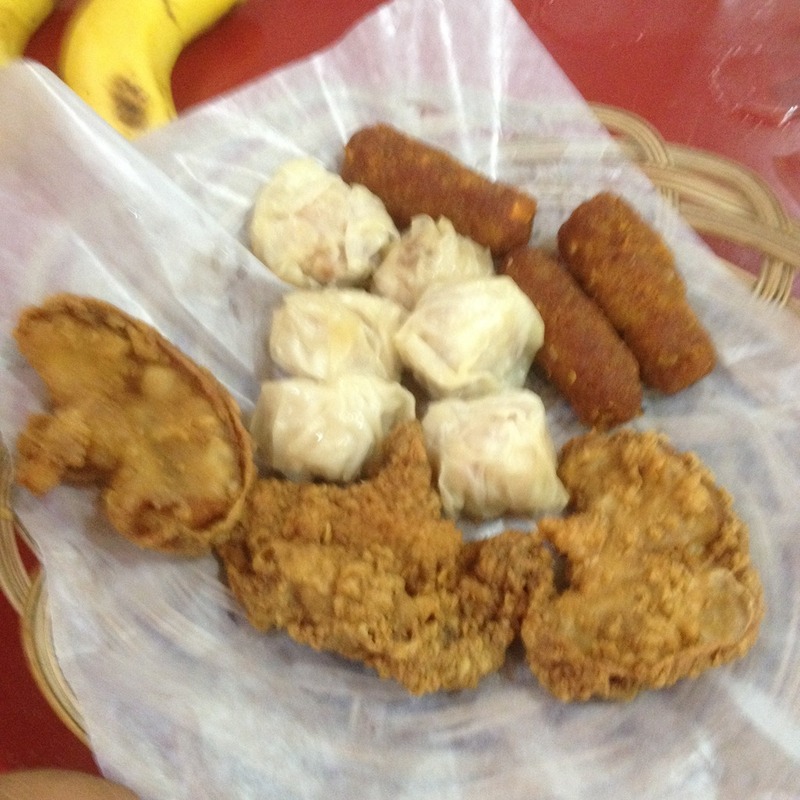 They probably deep fried the meat straight from the freezer and did not boil the pork in water. The sweet blend soy sauce that came with it somehow made things better. I usually don't comment about the drinks. But their house blend iced tea pitcher at is worth mentioning because at 2 liters and only PhP 135, it's such a good bargain. And this is good iced tea too. The menu identifies Stan's Fried Black Pepper Shrimp and Lola Pepang's Fried Manok as the chef's specialties. I haven't tried both dishes. It's on my list the next time I visit the restaurant. Another item on the menu that I tried and liked was the Shrimp in a Bag. It comes in different flavors or sauces. My favorites are the Whole Choobang, Spicy Gata, and Butter Garlic. 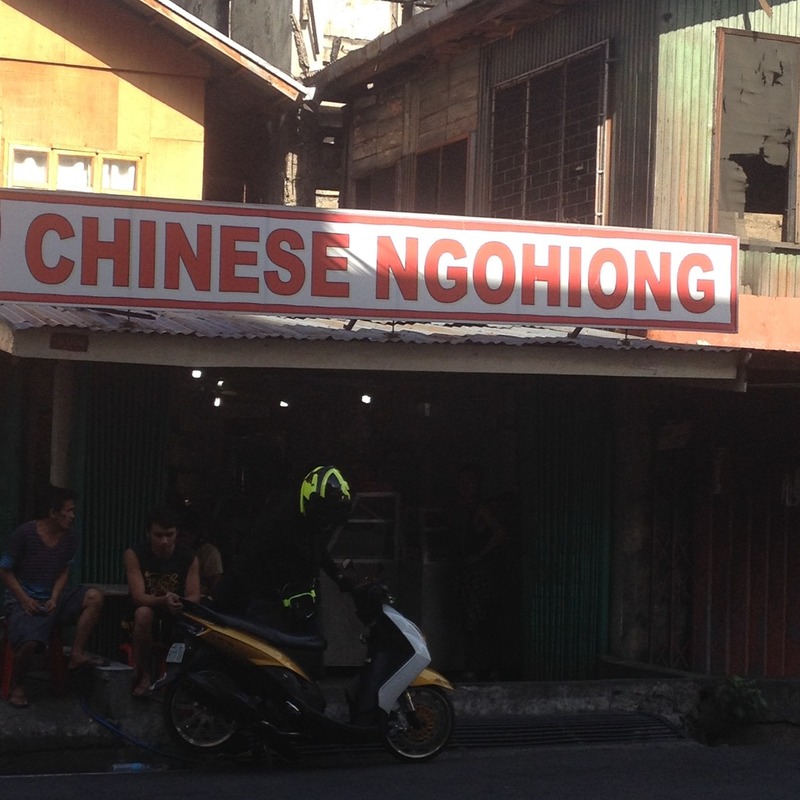 Other flavors include Sauteed in Garlic, Choobi Sauce, and Salted Egg Shrimp. You may call +63 32 405 6010 for delivery. Have you eaten at any of this restaurant's branches? We'd love to hear your experience. You may tell us in the comments section below. 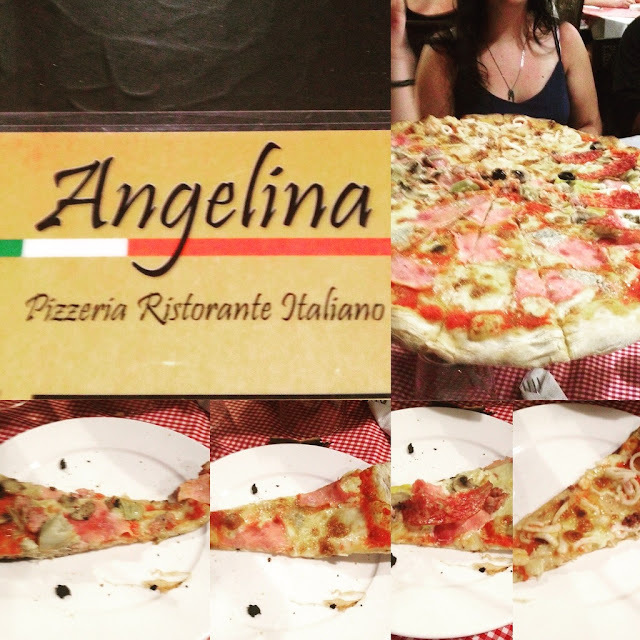 One of the more popular restaurants in Malapascua Island is Angelina Pizzeria. It is a stone's throw away from Logon Beach. We were staying at Thresher Shack this past weekend right on Logon Beach. During Sunday dinner, the place was packed. Guests were mostly foreign tourists. It can almost pass off as a place outside the Philippines. Luckily, our host made a timely and almost last-minute reservation for our dinner date. Angelina Pizzeria is an Italian restaurant. 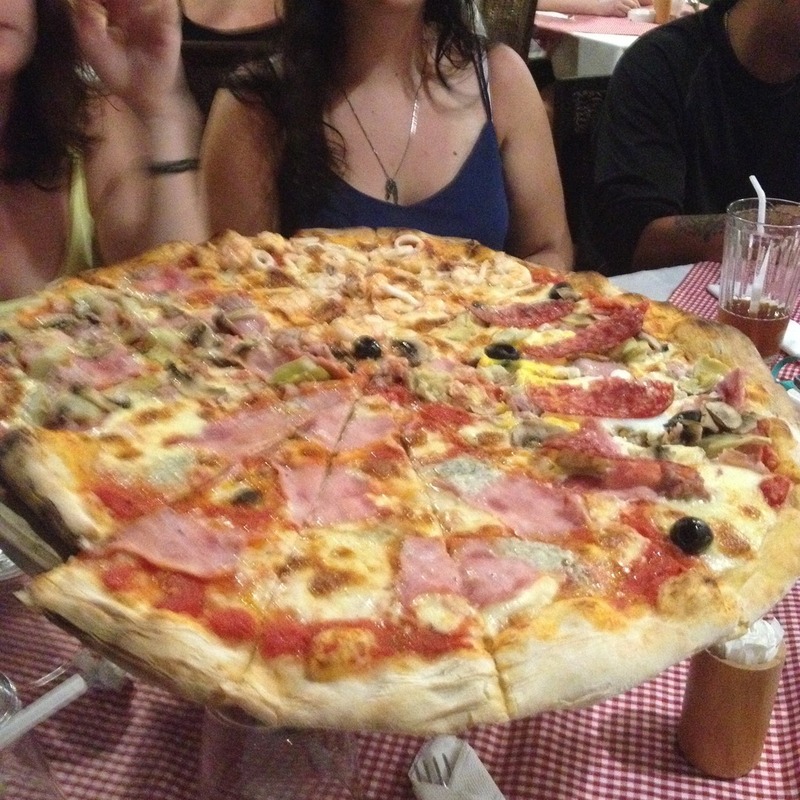 As such, the specialty here is pizza, pasta, and other things Italian. Many people have associated scuba diving to an expensive hobby. While scuba diving may indeed be an expensive hobby and equipment-intensive activity, there are ways to enjoy it by not spending too much money. This past weekend, I spent some time at Malapascua Island trying to learn basic scuba diving skills. We were introduced to a dive package for scuba diving "virgins" at Divelink Cebu. It was an all-in beginner package they like to call the Barely Wet Weekend. For starters, it's not even just available on weekends. It's just that it is best for long weekends. Scuba is an abbreviation for self-contained underwater breathing apparatus and scuba diving is underwater diving using this apparatus. Basic dive gear include a compressed air tank, buoyancy control device, regulators, fins, and scuba mask. 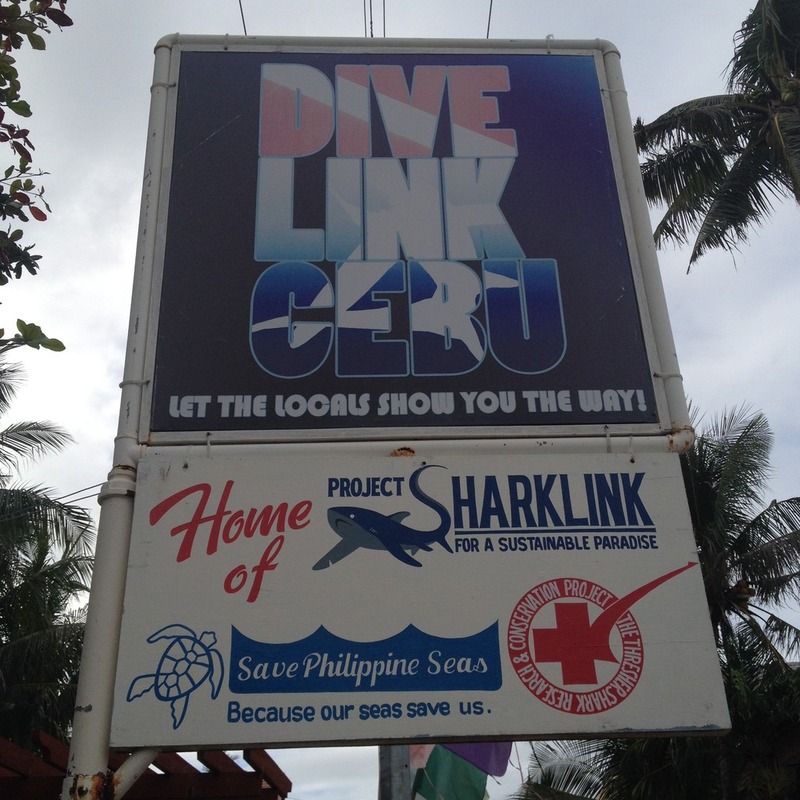 Divelink Cebu is the first Filipino-owned all local dive shop in Malapascua Island. Situated right on Logon Beach, it is the first commercial establishment that greets you upon arrival on Malapascua Island. A PADI-certified dive resort, Divelink Cebu is involved not only in diver certification. They are also engaged in various advocacy efforts focused on conservation. They are heavily involved with Migo sa Iho (Daanbantayan Bantay Dagat Task Force), Project Sharklink, Save Philippine Seas, Thresher Shark Research and Conservation Project, and Green Fins. Based on my experience, I would say the dive instructors, dive masters, and dive guides at Divelink Cebu are one of the most patient lot I have ever come across. I am generally uncomfortable around water but they made me feel secure and safe around them. In Malapascua, Divelink Cebu is a well-respected corporate citizen. In the aftermath of Typhoon Yolanda (international name Haiyan), the dive shop closed for two months to give way to relief and recovery efforts. They ran a highly successful work-for-materials scheme. Affected island residents helped out in clearing operations and other tasks to restore normalcy in the island. They did this in exchange for materials to help them rebuild their homes and basic necessities such as food, water, diapers and the like. Recently, Divelink Cebu was one in declaring support to Migo sa Iho Daanbantayan Bantay Dagat Task Force. Seven task force members were charged with slight illegal detention for apprehending two commercial fishing boats off Kinatarcan Island. Malapascua Island is an island off the northern coast of Cebu. It is part of the municipality of Daanbantayan, the northernmost town of Cebu province. While many people compare Malapascua with Boracay, it is more of a dive destination than a beach paradise. Beautiful Guimbitayan Beach is also situated on the island however. Dive destinations abound around Malapascua Island: Los Bamboos, Monad Shoal, Quimod Shoal, Dakit-dakit, Evo Reef, Coral Gardens, Japanese Ship Wreck, Lapus-lapus, Maria's Point, Big Rock, North Point, Deep Rock, Quillano, Twin Islet, Deep Slope, Ka Osting, Divelink House Reef, Chocolate Island, Doña Marilyn Wreck, Gato Island, and Kalanggaman Islet. Aside from the various dive sites around the island, other attractions at Malapascua Island are Logon Beach, Bounty Beach, Guimbitayan Beach, the Virgen de los Desamparados chapel, watching the sunset on the beach, and the island's lighthouse. Malapascua Island is also a good jump off point for those who wish to go to Leyte's famous Kalanggaman islet and sandbar. Perfect for long weekends, the Barely Wet Weekend is a dive and stay package designed for scuba diving "virgins" or those who have no experience with scuba diving. 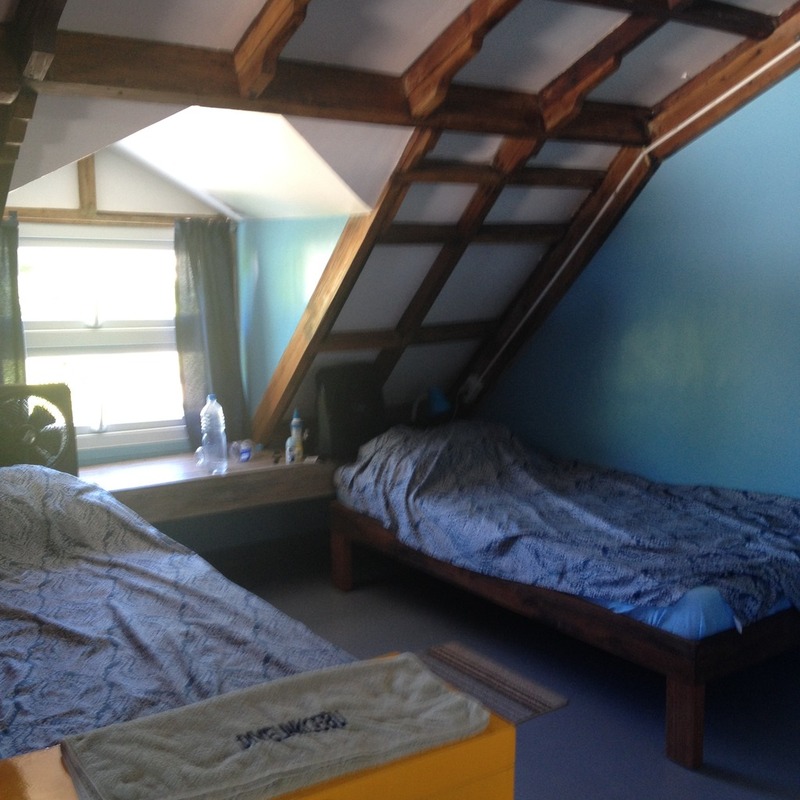 2 nights stay at the Thresher Shack, a dormitory type accommodation shared with other guests. You get your own bed and access to a balcony with a great view of Logon Beach, locker, reading lamp, and desk fan. The Thresher Shack is right on the Divelink Cebu property on Logon Beach. One night stay at the shack is priced at PhP 600 per person. This part of the package has a PhP 1,200 value. 1 Discovery Scuba Diving (DSD) valued at PhP 3,500 per person. This is a quick way to introduce scuba diving to newbies. It is basic training on how to use diving gear and equipment such as the buoyancy control device (BCD), scuba mask, fins, regulator, dive gauges, and tanks. Training also includes the basic skills of breathing underwater through the regulator, mask clearing, reading the gauges, basic hand signals, and regulator recovery as well as entering and exiting the water. 2 Fun Dives valued at PhP 1,500 per person for each dive. That's a total value of PhP 3,000. A PADI DSD Certificate for completing the Barely Wet Weekend. Should one decide to pursue the PADI Open Water Diver (Level 1) Certification within one year from the experience, you will be required one less dive to complete the certification. Should you decide to pursue your certification at Divelink Cebu right during the same period you availed of the Barely Wet Weekend package, this translates to savings of another PhP 3,500. The cost of the Barely Wet Weekend package starts at PhP 5,000 per person for a pair. The cost goes down to PhP 4,800 per person for a group of four. It is at PhP 4,600 per person for a group of six. You get to enjoy of up to a PhP 10,200 value at bargain prices. That's more than a 50% discount for you. Round trip transfers from Metro Cebu to Malapascua Island. Transfers from Mactan Cebu International Airport, seaport, or at any point in Metro Cebu to Malapascua Island and vice versa are not covered in the price for the Barely Wet Weekend package. For those who have not been to Malapascua Island and wish to go there on public transportation, they can ride a bus bound for Maya Port in Daanbantayan town. Bus fare is around PhP 180 per person one way. 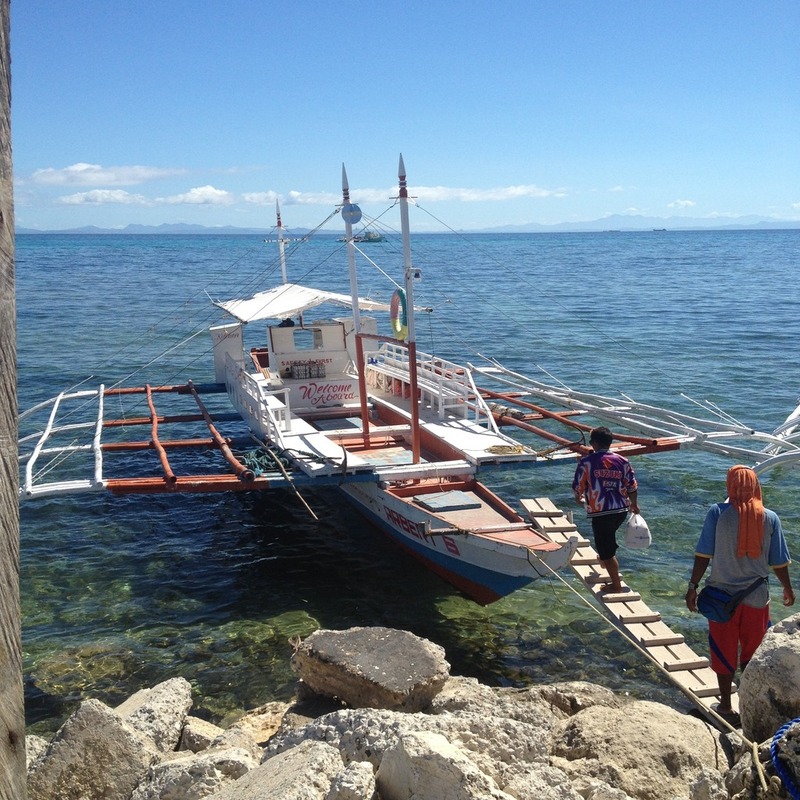 From Maya Port, ride a pumpboat bound for Malapascua Island. Boat fare is PhP 100 per person one way. 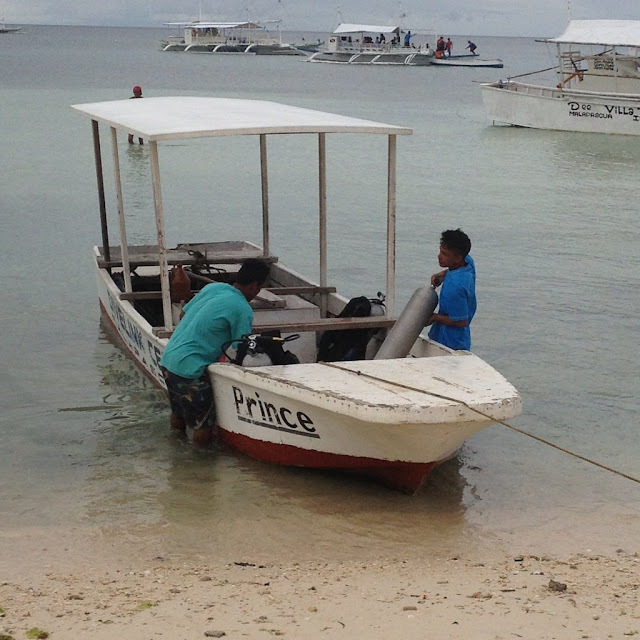 When one gets to Malapascua, they may need to get on a smaller boat or a skiff to get to shore from the bigger boat. This will cost an extra PhP 20 per person. Divelink Cebu is right on Logon Beach, a few meters walk from the shoreline. As an alternative, Divelink Cebu can also arrange transfers for guests at a cost of PhP 3,500 one way per van. Each van can accommodate at most ten people seated comfortably. Meals. Divelink Cebu does not have its own food and beverage section or restaurant. Guests will have to spend for their own meals. They can explore some of the restaurants in the island. Malapascua Island is not an expensive place to dine. There are many restaurants that offer affordable meals. Ging-ging's Restaurant is among the more popular ones. For a more fancy meal, Angelina Pizzeria is also a popular choice. Both restaurants are within short walking distance from Divelink Cebu. Documentation. You will have to provide for your own camera to document your first diving experience. It is best to bring a reliable underwater camera to capture memories of your first scuba diving experience. Insurances. Make sure that you have adequate insurance cover. While it is not a requirement, it is best to arrange your medical, accident, and life insurances. Well, not only during your first scuba diving experience but while you are still young and able. Premium rates usually become more expensive as you grow older. To know more about the Barely Wet Weekend package and to access instructions how to avail of the package, please CLICK HERE. Have you availed of the Barely Wet Weekend Package from Divelink Cebu? We want to know how it went. You may share your experience in the comments section below. The gastronomic culture of Cebu is a world worth discovering. It has its own deeply-rooted traditions such as the interesting history of humba. The local culinary culture also has its share of foreign influences such as the world-renowned lechon. In these modern times and the era of globalization and glocalization, Cebuanos have maintained their own local culinary traditions. Yet they are also welcoming restaurant brands not only around the Philippines but also from all around the world. One way to explore this wonderful world of the Cebuano food scene is to log on to Cebu's top food blog, the Kalami Cebu blog. 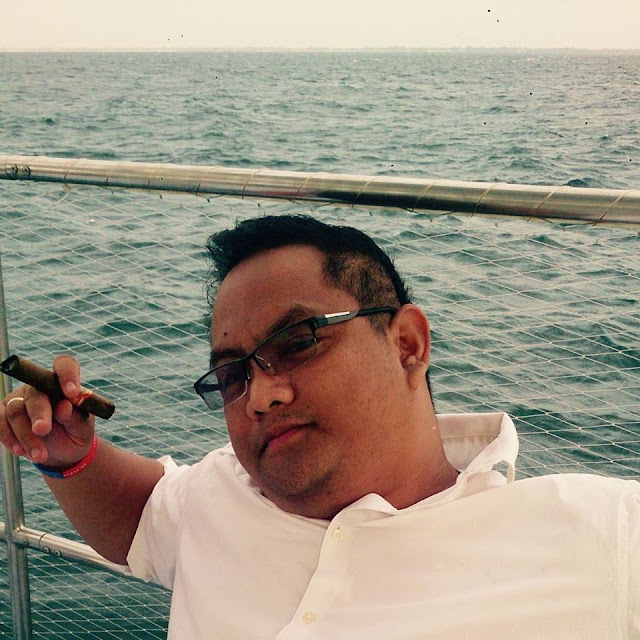 The blog is authored by rainmaker and Cebu's leading food blogger Carlo Andrew Olano. Carlo or Caloy is the community lead for food blogging at the Cebu Blogging Community. He blogs to help people find the best places to eat in this part of the Philippines. The Kalami Cebu blog is one of Cebu's best food blogs. It is a very reliable reference for restaurants in this Central Visayas province. It is the aim of the this blog to help its readers learn about places of interest and things to do in Cebu. 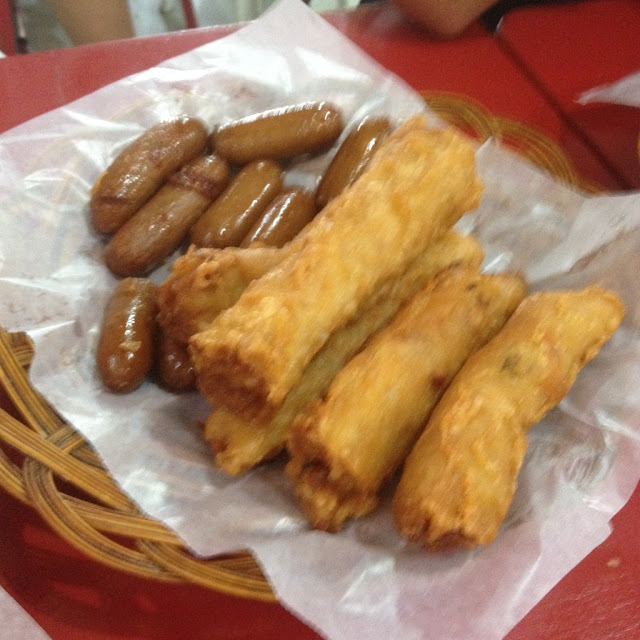 One of the sections of this blog is dedicated to dining in Cebu. The page is a work in progress directory of bars, cafes, and restaurants found all around the province. Having the Kalami Cebu blog is a helpful reference not only for me as a blog author. It is also helpful for this blog's readers who are particularly interested in finding places to dine and exploring what kinds of food to try while they are in Cebu. So to you foodies out there who are in Cebu or who are planning to visit, it is but right to bookmark the Kalami Cebu blog for your reference.